Julius Cavero, T-KID (or Terrible T-KID 170) was born 1961 New Jersey. In 1968 T-Kid had first encounter with graffiti at 7 years old. He starts to notice names like TRACY 168, PHASEII, STICH ONE & THE MAN 500. In 1969 after his parents’ divorce, T-kid leaves the South Bronx and goes to live in Puerto Rico. In 1972 he moves back to Queens. Soon after, T-kid runs away to move in with his father in the Bronx. T-Kid begins to build a solid reputation as a great acrobat on the swings and starts to write KING13. He is quickly noticed by a gang called the “Bronx Enchanters” and recruited as he starts taking up b-boying. He changes his name to SEN102. In 1977 badly wounded by three gunshots in a gang shout out, T-kid is left almost dead in a park. Hospitalized in the emergency unit, T-Kid survives. While in bed for many weeks, he draws endlessly and chooses to become T-Kid 170 (T for the tall and skinny look he had, and kid was just what many people called him). T-kid gives up his gang life to focus on his art. The adventures of T-Kid 170 begin. Tracy 168 becomes his mentor Padre Dos teaches him rhythm and style. Along with Peser, he starts a crew called The Nasty Boys (TNB). 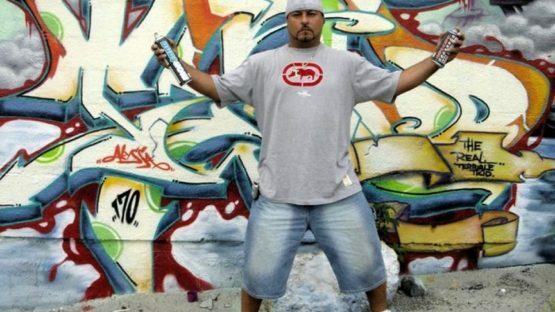 He paints trains with BOOZER, KEL 139, SHY147, RIN, SHOCK 123 and CRAZY 505 (his brother Alex) Today T-Kid’s crew T.N.B. is a cross-border organization. Its members include people from Germany, France, the UK and Spain. Its unique lettering style with inserted characters has become well known throughout the world and inspired many imitators and followers. Mist and Jay (who are taking part in the exhibition) acknowledge T-Kid’s influence. T-kid has been shown at many exhibitions in Europe as well as New York.